East of Eden opens in Krakow in 2 weeks! “Exercise Exercise Repetition” can be just a random grouping of words without meaning. For Kean University students, it’s the title of the James Howe Gallery exhibition, “Project Exercise.” The gallery opened on Sep. 3 in Vaughn Eames, the Fine Arts building on campus. Artists featured in the gallery were students from Jan Metejko Academy of Fine Arts in Krakow, Poland. The Guest Curator of the exhibition is Kean Fine Arts adjunct professor Joanna Wezyk. The various artists included were Zbigniew Bajek, Roman Fleszar, Elzbieta Zrobek and Krzysztof Marchlak to name a few. “At the opening artists came from Poland and were excited to have their work at The James Howe Gallery,” said Franki Vicini, a graduate student worker at the Karl and Helen Burger Gallery, who worked as security at the opening to make sure that no one was touching the artwork that was displayed. At the opening, Alumni of Kean and current Kean students were among some of those that showed up. “The exhibition was popular because the artists’ work was so different,” Vicini commented. The professors from Krakow Academy, along with graduate students, presented works in diverse media. Some of the art that was displayed were paintings on canvas-like material, different-shaped images and abstract images that featured the use of light and dark colors. One of the images displayed was one of someone playing a piano. This image put emphasis on many aspects, including the form of someone’s hand before they play the piano and detailing the hand to the keys being touched as the person plays.The unique nature of each piece allowed the exhibition to inspire other artists at Kean and beyond to continue to bring forth very inventive art. 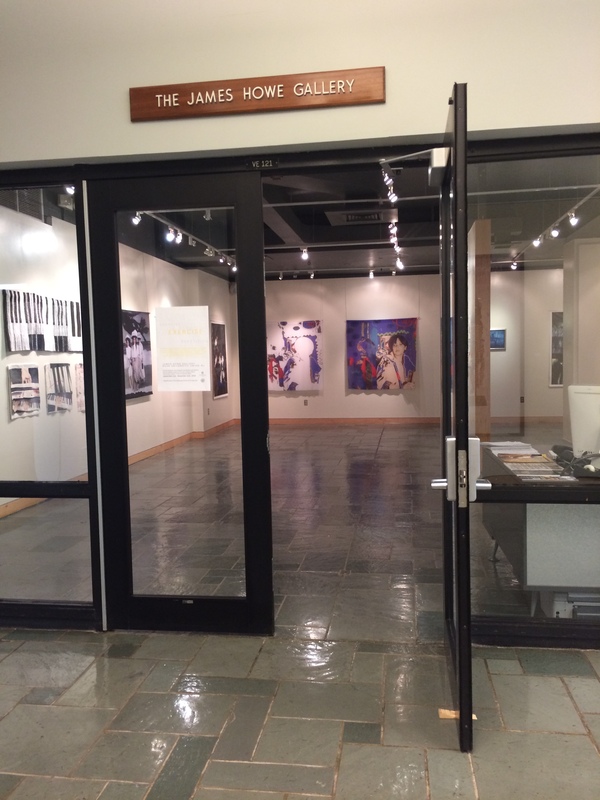 The James Howe Gallery is located on the first floor in Vaughn Eames. Project Exercise is opened now until Nov. 12. Now through November 2, 2014 at the James Howe Gallery at Kean University’s Vaughn-Eames Hall, experience the works, in diverse media, of six professors and six of their Ph.D. students from Jan Matejko Academy of Fine Arts in Krakow, Poland. The Exercise is an exploration through various artistic installations of how the concepts of repetition and multiplication relate to the concept of space. Participating artists from the Jan Matejko Academy of Fine Arts include–faculty members: Prof. Stanislaw Tabisz, Rector of The Academy of Fine Arts, Prof. Zbigniew Bajek, Prof. Teresa Kotkowska-Rzepecka, Prof. Lilla Kukla, Prof. Joanna Zemanek and Prof. Adam Wsiolkowski, and doctoral-level students: Izabela Apananska, Jolanta Kusmierska, Iwa Kruczkowska-Krol, Krystyna Malinowska, Roman Fleszar, Elzbieta Zrobek and Krzysztof Marchlak. Kean University Adjunct Professor Joanna M. Wezyk, who served as guest curator for the exhibition, noted that Exercise is a response to the repetition that is present in the sphere of advertising, errors and rituals. The participating artists view rituals are more than mere repetition, but instead a method of enchanting the world. Repetition represents the form as well as its excess, and is the way of creating the space “from – to” and symbolizes the transition from the external to the internal. In conjunction with The Exercise, works by students and faculty of Kean’s School of Performing and Visual Arts will be on exhibit in the Student Art Gallery, located across from the James Howe Gallery. “Project Exercise plans to facilitate collaborative exhibitions of works by the students and faculty of Kean’s School of Visual and Performing Arts and Krakow Academy of Fine Arts,” said Wezyk. The project will be carried out through panel discussions and seminars whose topics will explore the current artistic world and exhibition spaces in both New York and Krakow, Poland. “The opportunity to exhibit the artwork at Kean will establish the presence of the Krakow Academy of Fine Arts and its students in its artistic milieu, while they become familiar with the work of Kean students. The collaborative exhibition in Krakow will allow the students from Kean to present their work and introduce them to one of the most prestigious and the oldest art schools on Europe,” she added. The group exhibition of the faculty and doctoral students from Jan Matejko Academy is the latest collaboration between the Polish university and Kean. Three years ago, Wezyk organized a series of exhibitions for her students from Kean University with some professors and their students from the School of Visual Arts in NYC, the Academy of Fine Arts in Krakow and the University of Rzeszow. “The shows took place in Manhattan, New Jersey and Poland allowing our students to display their artwork both in the Europe and the U.S.,” said Wezyk, who is an alumna of the Krakow Academy. Since then, she has invited many of her Kean students and alumni to participate in international shows as a means of “exchanging ideas between art schools and departments within various institutions of higher education and galleries.” This latest project with the Academy of Fine Arts will bring the artwork of Kean students to professional galleries in Poland and other countries in the European Union. In addition, the Krakow Academy of Fine Arts has invited Kean faculty and their students to showcase their artwork and lecture in their space. Most recently, shows took place at Limelli Gallery in Krahow and Moriszewski’s Palace Museum in Bedzin, Poland. This fall, our students will have an opportunity to present their body of work in Dublin and Budapest. Pictured (l to r): Izabela Apanańska, Jolanta Kuśmierska, Roman Fleszar, Iwa Kruczkowska-Król, Krystyna Malinowska, Kean University Adjunct Professor Joanna M. Wezyk, Dean of Kean’s College of Visual and Performing Arts Dr. George Arasimowicz and Dr. Joanna Zamanek at The Exercise exhibition in Kean’s James Howe Gallery. Krakow Academy of Fine Arts in Poland present works in diverse media.